At the Macao Science and Technology Awards 2012, held in October, a UNU International Institute for Software Technology (UNU-IIST) research project was presented with the second-class prize in the Natural Science Award category. The award recognized the UNU-IIST project rCOS: A Formal Model-driven Engineering Method for Component-based Software, which has been led by Dr. Zhiming Liu (UNU-IIST Senior Research Fellow) and Dr. Xiaoshan Li (Associate Professor, University of Macau) with a broad array of international collaborators. Research on the rCOS (Refinement of Component and Object Systems) method seeks to solve the problem of program correctness, a long-standing major challenge in the field of computer science. The UNU-IIST rCOS method research, which started about a decade ago, is one of the methods for addressing this challenge. To date, more than 60 research papers on rCOS have been published in mainstream international journals and conference proceedings on theoretical computer science and software engineering. Research in the rCOS method has made significant contribution to the UNU-IIST mission in the area of education and capacity building. In addition to three major projects at UNU-IIST funded by the Macau Science and Technology Development Fund, ten projects in Mainland China on further development of rCOS and seven projects based on or using rCOS have been funded by the Chinese National Nature Science Foundation, Ministry of Education, and the 863 and 973 Programmes of Chinese Ministry of Science and Technology. The Macao Science and Technology Awards aim to reward those who contribute to local scientific and technological activities, inspire the enthusiasm and creativity of local scientists and technologists, and accelerate the development of scientific and technological undertakings in Macao. This is the first time the awards have been given. At the ceremony to the present the awards were a number of high-ranking government officials, including Macao SAR Chief Executive Chui Sai On. Coming from a strong mathematics background, Dr. Liu of UNU-IIST was drawn to the concept of using mathematics and logic in system modeling, analysis, design and verification. An interview with Dr. Liu about the rCOS method research project and the IT research environment in Macao recently appeared in the Macau Daily Times. 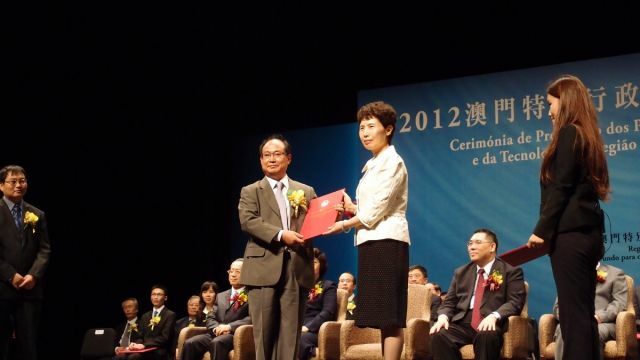 Dr. Zhiming Liu, the main investigator of the rCOS method, receiving the award at the ceremony.